During the Commonwealth (1649-1660) Oliver Cromwell declared the Irish language illegal. The law was not enforced in Ireland outside the major spheres of English influence. Irish was widely spoken all over Ireland up until the time of the Great Famine. After the massive emigrations of the 1840's, Irish declined and English increased in popularity throughout most of Ireland. However, Irish continued to be spoken in the less populated area particularly in the west of Ireland, and above all in County Mayo and the Aran Islands. Patrick McCormack who was accepted as an apprentice in Hearns, one of the shops in town, in 1880 with the comment that, "Being bilingual was an advantage in being accepted for training, as Hearns catered for both the wealthy English speaking land owners and the native Irish speakers who thronged the town on fair and market days." Carmel Callanan whose father's uncle "had a great command of Irish but never went to school- became Chief Engineer in a big firm in America." 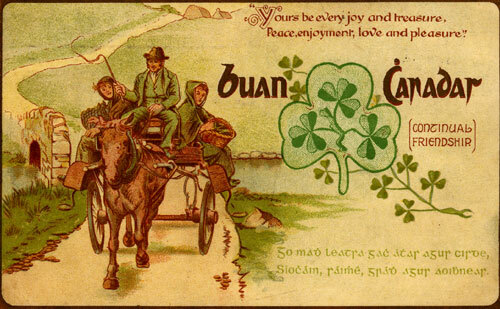 According to census studies, the numbers of solely Irish speakers in Cannaught fell by a third between 1881 and 1901, while literacy rates in English increased commensurately. As a consequence much of the traditional music and folklore in Irish was lost. However, these changes were uneven in Mayo and many people maintained the old traditions. The 1901 census in Ballinrobe shows that all of the Catholic adults in the area were bilingual Irish/English speakers. The 1901 Census in Mochara (the birthplace of Maggie Langan and her mother, Penelope Byrne) included 17 dwellings. All of the inhabitants except two were Irish/English speakers. The exceptions were an eighty year old widow and a fifty year old widow who only spoke Irish. There were other people in Mochara in 1901 who were in their 50s, 60s and 70s who were listed as Irish/English speakers. "In 1901, the percentage of people speaking Irish and English nationally was 13 per cent. The figure for Connacht was 36 per cent, and the figure for Headford was 43.2 per cent. Nationally, the percentage that spoke Irish only was 0.5 per cent, compared with 1.9 per cent for Connacht and 0.97 per cent for Headford." Note: Headford was just south of Shrule Parish. It can be assumed that the Walshes, Langans and related families were Irish/English speakers. Marilyn Krausch (the daughter of William Walsh) told me that her father said that Penelope Bryne Langan, the wife of Mathias Langan was predominantly Gaelic speaking. 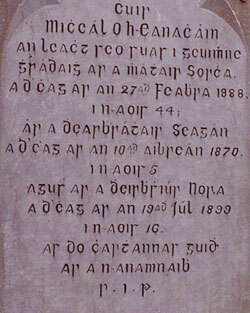 The tombstone inscription on the left is in Irish. Mary Heneghan Mochara Died 6th March 1931, aged 54 yrs. Her Husband, John Died 1st Sept 1966, aged 92 yrs.